Yamuna was once upon a time one of the most beautiful rivers of India. Shah Jahan loved the beauty of the river so much that he changed his capital and also landed up building the most beautiful structure of Indian history the Taj Mahal, on the bank of River Yamuna. However the extreme pollution is on verge of killing the river entirely. 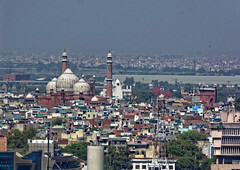 Yamuna provides a dramatic yet extremely magnificent backdrop to the Taj Mahal. Experts believe that the river is perhaps the main reason for amplification of the beauty of the 7th wonder of the world. Yamuna is the largest tributaries of the Ganges River and originates at Yamnotri Glacier which is 6400 meters above sea level. As it has a knack for creating highly fertile alluvial soil, most of the areas adjoining the Yamuna consist of agricultural lands. Walking along the bank of River Yamuna one can easily enjoy the site of Taj Mahal and Agra Fort on one Bank while Chini ka Rauza, Itimad ud Daulah on the opposite bank. The cool breeze and nostalgic sunset is an added benefit for a nice romantic evening that one must surely try."